Playing Bloody Zombies put us in mind of another Switch eShop game that launched recently in Guns, Gore & Cannoli. Just like that game Bloody Zombies mixes old school side-scrolling action, cartoony yet hyper-violent graphics, waves of undead opponents and a smattering of broadly drawn national stereotypes. Whereas Guns, Gore & Cannoli is an ode to Metal Slug and other classic shooters, however, Bloody Zombies tips its blood-stained hat to Final Fight and Streets of Rage. It's the kind of brawler that used to pack out arcades in the early '90s. As the action edges its way to the right you can move your chosen character in all directions using the left stick. Executing a double flick to either side will set you dashing in that direction; Y and X handle your standard light and heavy melee attacks respectively, with various sequences of the two yielding a range of damaging combos. You can also combine those attack buttons with the jump command (assigned to B) to initiate jumping kicks and punches, while A enables you to interact with switches and pick up items. As with any self-respecting beat-'em-up, there's nothing more satisfying than picking up a sword, shovel or iron bar and using it to wail on your opponents. On the more subtle side of things, tapping ZL will make your character perform an evasive dodge in the direction you're holding. This is nigh-on essential if you want to survive the game's punishing boss battles, or even some of its tougher foot soldiers. Those are the basics of combat, but there are also various special attacks you can initiate once you've collected the appropriate power-up. With that done, a quick movement combination followed by X will initiate a powerful move that eats into your limited energy bar. There's an undeniable visceral thrill to Bloody Zombies. 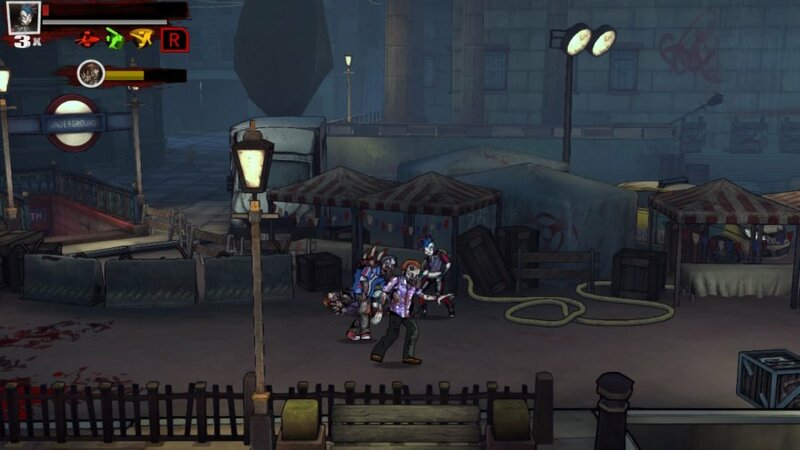 The game's moody post-apocalyptic London setting feels fresh despite its familiar zombie protagonists, and both justify the lashings of cartoon violence and free-flowing red stuff. It's also nice to see a number of secret areas to uncover. Don't get us wrong, there aren't lots of secrets to found in every area, but finding a hidden stash of items and bonuses behind a breakable barrier provides a welcome diversion from the intense slog of combat. Which unfortunately speaks to the general tone of the game. It feels an awful lot like hard work at times, with repeating waves of enemies that take a considerable beating before going down. 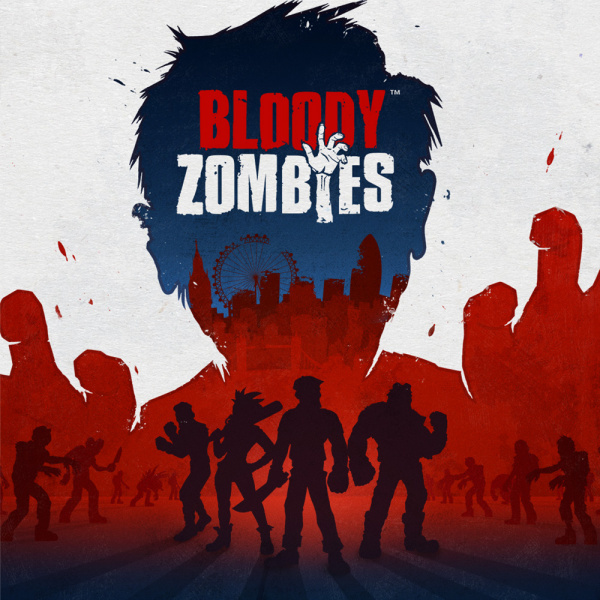 The action in Bloody Zombies feels somewhat sluggish, while unpredictable contact points often leave you flailing away at thin air because your character and the enemy are on slightly different 2D planes. 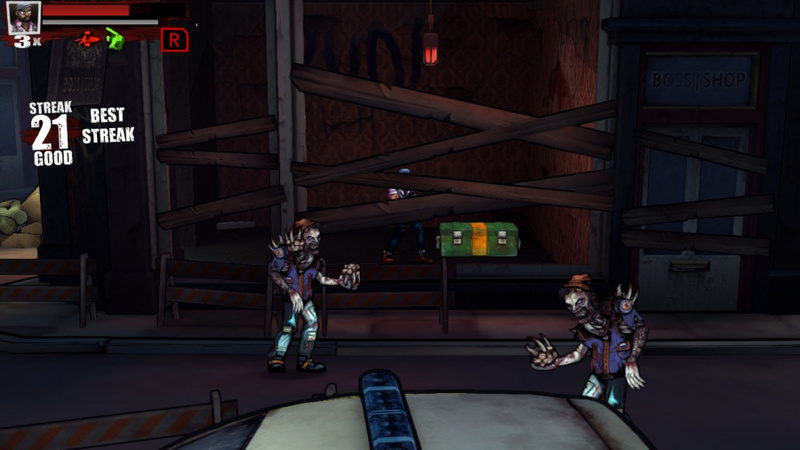 There's also no getting away from the fact that Bloody Zombies is a button masher in the classic sense of the term. 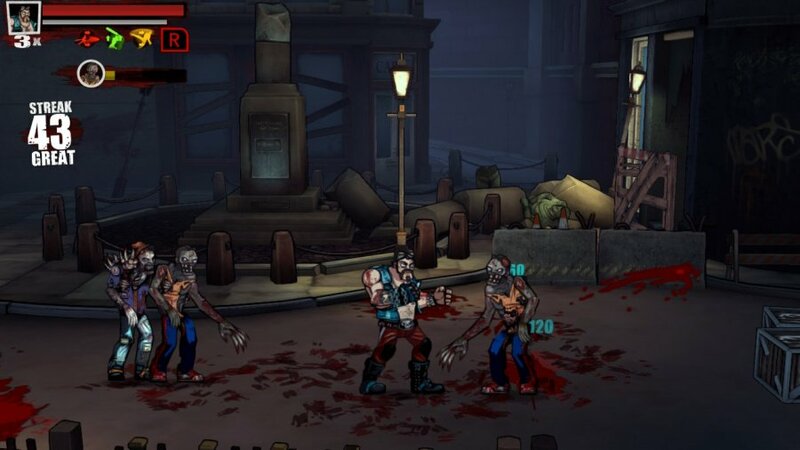 Its cel-shaded graphics might make it look a lot sharper and more sophisticated than the arcade beat-'em-ups of old, but it's barely any smarter, and pummelling zombie heads soon becomes repetitive. That's not helped by the fact that each of the four playable characters controls and moves identically. The animation and vocal lines might be different between lithe punk Rei, sharply dressed hipster Teller, hulking biker Mick and extreme sports type Eddie, but they essentially have the exact same roster of moves. It's a particular shame in relation to local multiplayer. With everyone stomping around doing the same basic things with no scope for specialisation, it can all become a little rote and repetitive. Still, local multiplayer remains the best way to play Bloody Zombies. We were pleasantly surprised to see that there are options for playing online, but games like this are always at their best when all participants are sat in the same room. You'll need all the help you can get, in truth, because this game poses quite a challenge. Enemies aren't particularly smart, but they do pose a large threat in combination. They tend to attack in repeated waves of fours and fives, each chipping a little more from your health bar. With an old school lives limit it's tough to make progress, though you can restart from the beginning of the last level you reached. How many times you'll actually wish to do that depends on your enthusiasm for old school brawlers and your appetite for attritional button-pounding combat. Even then, Bloody Zombies doesn't quite manage to live up to the same heights as its influences. 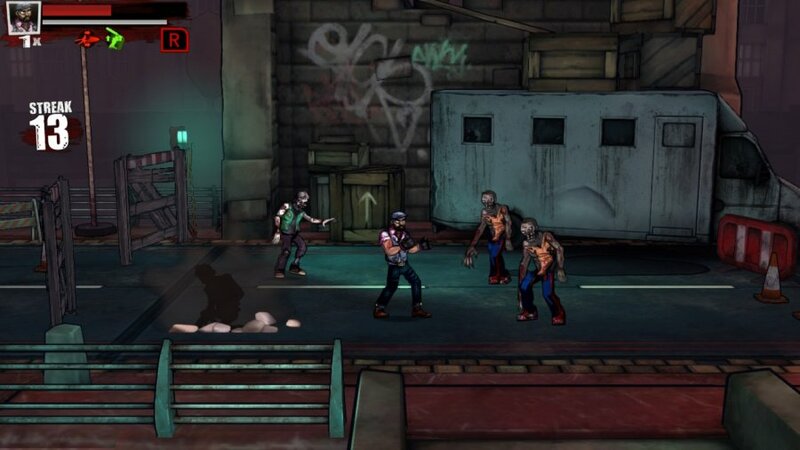 Bloody Zombies brings a fresh visual style and a couple of interesting touches to the classic scrolling beat-'em-up. Unfortunately it doesn't flourish where it matters most - the quality and scope of its combat. There's still a fair amount of mindless fun to be had in local multiplayer, even if Bloody Zombies lacks the fluidity and variety to become a true regular on your co-op Switch game roster. Even with the middling review this one still looks good to me. It's earned a spot on the wish list for when it gets a sale. It is not my favourite art-style but what it does, it does so solidly. 7/10 from me for all the Britishness about it. Sounds like it has similar issues that Code of Princess (a beat'em up rpg) had on the 3DS. Said game looked fairly pretty but the combat was sluggish and awkward. Still enjoyed Code of Princess (the writing was witty and fun, so that helped). So I'll check some gameplay videos and see if it is something worth buying even with its flaws. Reading through the review was quite interesting. The tone went went from glowing to meh in a heartbeat. I'm disappointed the reviews for this game isn't as good as I hoped. Shame as I'm always on the lookout for 4-player co-ops. Why can't they make a Switch game like Dead Nation on PS4? Twin-stick zombie shooter from a top-down view? It's a pity that Housemarque is tied to Sony, their games will shine on Switch. I love brawlers, good or bad gameplay, but I don't like the graphical style of this game. With a proper sale I could change my mind. 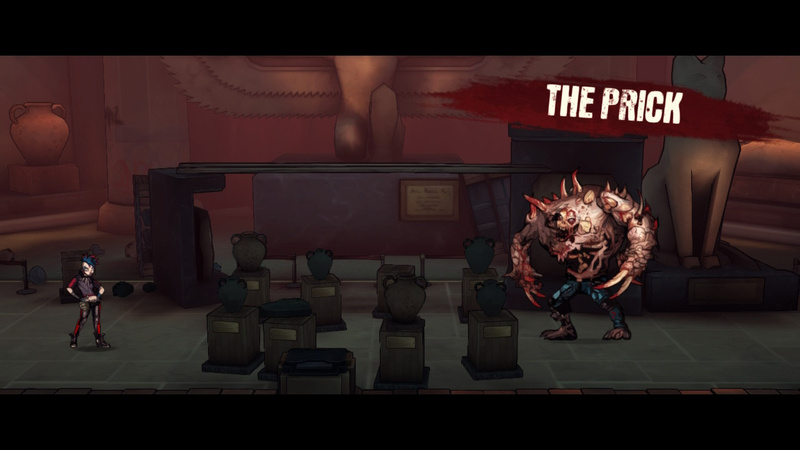 First it's a game about shooting the undead (Guns, Gore & Cannoli​) and now it's a game about punching the undead (Bloody Zombies). The undead could never take a rest do they? Seem that a 6 review score is common with the undead now, we already got two game reviews about the undead by the same person with a score of 6, maybe we'll get a third undead game with another 6. OMG it's going to be 666, could this be a sign that Jon Mundy is part of the Illuminati? Sounds like the reviewer doesn't enjoy beat-em-ups in general. I don't ever remember playing one that had much scope to its combat. For the most part it was kick, punch, dash, jump kick and a special that reduces your health meter. The best games in this genre, Final Fight and Streets of Rage 2 were button mashers from beginning to end with very little variety. Going by the other reviews I've read of this game it sounds like it achieves exactly what the developers wanted to achieve. A classic beat-em-up that offers a good challenge with a unique theme. Wulverblade was the same and I love that. Buying it tonight. @OorWullie Actually these were not the best in their genre. Turtles In Time and the Aliens vs Predator Arcade games had far more broad play mechanics. There was even some street fighter style fighting mechanics in AvP. This is one of those games that I can just tell immediately from the screens. It doesn't look like something that I would want to play, and judging from the review it seems like I was correct. I say get phantom breaker battle grounds overdrive instead. @Mommar I should have said "such as Final Fight and Streets of Rage 2".Still, look up any worthwhile top ten beat-em-ups and those 2 are usually in the top few places. I'd say overall the general consensus is SoR 2 is the best and most highly regarded. Unless you were a SNES only owner who had Turtles in Time. I've played both and I personally would have SoR 2 over Turtles in Time any day, as good as the Turtles one is. All the Capcom beat-em-ups were great too, X-men, Knights of the Round, Cadillacs & Dinosaurs but for me, none of them top the original Final Fight. One that I'd really love to play is Golden Ave - The Revenge of Death Adder. It's never made its way outside the arcades. Maybe some DLC and an update or two would fix this up; it looks like it has potential. I bought this game for the online play and the hopes of playing with my friends. It's one of the few purchases I regret on Switch. It's bland and boring and fails to capture the magic of classics like Final Fight and Streets of Rage 2. If you really want to support an indie brawler on Switch, definitely go with Wulverblade. It's much harder but it WAY more fun. @Mommar @OorWullie I never understood Streets of Rage. I thought the series looked and played boring back in the day, and still feel that way now. When I go to play a beat em up on my arcade, the arcade port of only gets picked when someone new comes over. There's the obvious ones like Simpsons, X-Men, AvP, Turtles, Battletoads, Golden Axe, the DnD games... Revenge of the Death Adder is a fun one. Hmm. Looks okay. Anyone ever played Night Slashers on MAME or in the arcades? I highly recommend that one. Amazing game. @Mommar Night Slashers, Bucky O'Hare and Hook are my favs. @frogopus Did you ever play Night Slashers, Gaia Crusaders or Hook on Arcade? Phenomenal. @Prof_Yoshtonics Yes to all. I played very few arcade games as a kid, born in 87 so I was a bit young for even the 90s arcade revival, but I built and tinker with an arcade in my basement. So in the last few years, I've played most of the major stuff. Hook was a favorite movie of mine growing up so the game gets a good bit of play in my house. Gameplay up for undecided folks. @Mommar Turtles in Time better than SoR2? Not even close. @KeeperBvK Yes, it plays better in every way. the only people who love Streets of Rage 2 were kids who only owned a Genesis and had to convince themselves it was better. It was not, it doesn't have as good play control even if the mechanics are more complex and the settings/characters are boring.